1. Which of the following is true about slippery road surfaces? On cold, wet days, shade from trees or buildings can hide spots of ice. Bridges and overpasses tend to freeze after the rest of the road does. Pavements are not slippery for the first few minutes after a rain starts. 2. When should you turn the ignition to the lock position while driving? If your accelerator sticks and you need to stop suddenly. If brakes fail and you cannot get them to work again. Always know what is happening around your vehicle. Follow the vehicle ahead more closely. Keep your radio turned off. 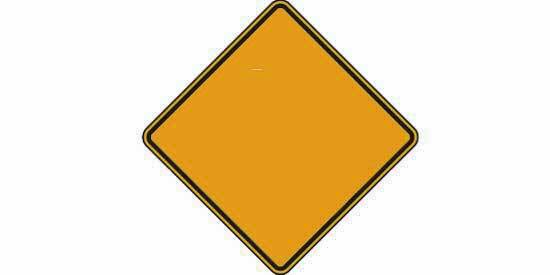 Alert any vehicles coming straight through from the other direction and make sure they stop. Allowed from any street after stopping and yielding. Allowed from a one-way street to a one-way street. When entering freeway traffic from an on-ramp. 7. Which is most important when you are backing out of a parking space? To rely on your mirrors. To keep both hands on the steering wheel. Vehicles from opposite direction start to move. All children have exited or entered the bus. The school bus driver closes the door. Flashing red lights are turned off and children have cleared the street. Not drive a motorcycle, unless you have a motorcycle endorsement. Turning left at the intersection is not allowed. You are driving the wrong way on a one-way street. You must not drive into a street in the direction you are going. 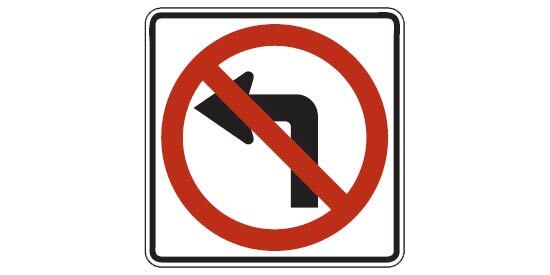 Making a U-turn at the intersection is not allowed. 13. When driving at night, which of the following is a requirement? Using your high beam headlights in business areas. Driving 10 mph below the posted speed limit. Using your parking lights if it rains. Only if an accident has occurred. Only if you have been drinking. The same path as the front wheels. A longer path than the front wheels. A shorter path than the front wheels. That you must always come to a full stop. That you must slow down to 15 mph or less. What to do if there is an emergency on or near the tracks. Wait until the police arrive before you move your vehicle. 19. What is true about bicycle riders on public streets and highways? They have the same rights and responsibilities as motorists. They must use the sidewalk to let other vehicles pass. They are never allowed to occupy the center of a lane. Moving to the right and reducing speed. Stopping immediately even in an intersection. Driving to the right edge of the road and stop. Avoid driving on interstate highways. Drive only if someone sits beside you. Drive at 30 mph or slower. 22. A pedestrian crosses a street on a Don't Walk signal. The pedestrian is halfway across when your signal light changes to green. What should you do? Drive around the pedestrian since you have the right-of-way. Wait until the pedestrian has crossed the street before you proceed. 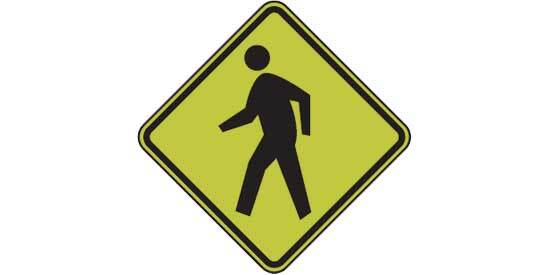 Proceed slowly if the pedestrian is not in your lane. 23. When is it reasonable to leave a sleeping baby inside a car? If outside temperature is between 50 and 70 degrees. If you leave the car for less than 30 minutes. If you set parking brake and remove key. In a space marked with a crosshatched pattern. A traffic signal shows a green flashing light. 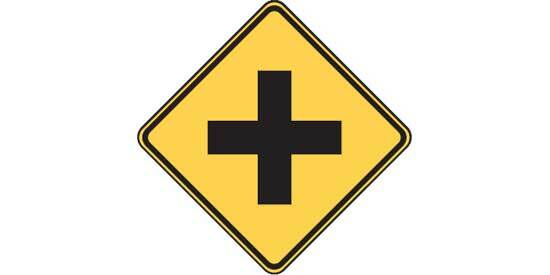 A vehicle ahead signals that it is OK to pass. The road ahead has curves or not. Yellow lane markings are solid or broken. Be placed in the front seat. Be placed in the back seat. The light is flashing yellow and you did not stop first. You cannot get all the way across before the light turns red. The light has just turned from green to yellow. Farther than normal from the car ahead. The same as under normal conditions. Closer than normal to the car ahead. 29. When may you drive at the maximum speed indicated by a speed limit sign? When conditions permit you to drive at such a speed safely. Only on divided highways, or highways designed for one-way traffic. California DMV Practice Test - 8 You got %%score%% correct answers of %%total%%. %%details%%. 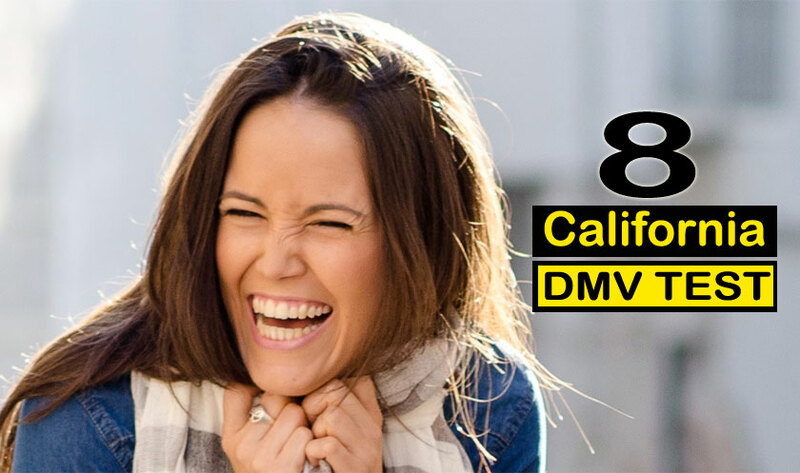 You should prepare well for your California DMV knowledge exam. First-time failure rate in California is above 40%, meaning almost 1 applicant of 2 fails the CA knowledge test the first time. Get the California Driver Handbook online or from your DMV office. Make sure you read it. Use practice tests to verify your progress. Each of our practice tests has 30 questions. It is less than the real test, unless you have to pass a re-examination (which has only 18 questions – half of the real test). The number of questions on the real California DMV knowledge test depends on your age. If you are under 18 years, the test has 46 questions. If 18 years or older, you’ll get away with just 36 questions. Remember, knowledge is built up over time. So is confidence. Don’t try to digest the driver handbook in just a few days or think that practice tests are the magic answer to passing the knowledge exam. To pass the knowledge test and become the best driver you can be, you need real insight and knowledge of California traffic laws. Starting with the right attitude and mindset is perhaps the best way to eventually get there. The difficulty of the California DMV exam is relative to the amount of time and effort you invest in studying. The more you know and understand about safe driving and traffic laws, the easier the test will seem. There are no trick questions on the test, just be sure to read everything carefully. Get more study tips from Joni Stark, an experienced driving instructor: What is the Best Way to Study for the DMV Exam? Be the first to comment on "California DMV Knowledge Test – 8"